Migraine Monologues: December MIGRAINEUR OF THE MONTH!!!! Mulled wine is brewing and hopefully migraines are not, yes it is already time for the second exciting Migraineur Of The Month! For December I am very pleased to introduce you to the incredible Hannah. As you will read below, Hannah has had to put up with an incredible amount since her migraines started in 1999, yet managed to achieve wonders despite all she has had to cope with. I know many of you will be able to empathise with what she has to say and will, no doubt, admire her hippy loving heart of gold. I can't remember my first classic (painful) migraine as it was over 11 years ago. I do, however remember my first vestibular and silent migraine which was on the 13 of June 2006. I was at the bus stop on my way to work and it felt like someone had hit me on the back of the head. I lurched forward and everything started to spin out of control, it went on and on and I fell out in front of the bus clinging on to the bus stop. I have no idea why or how I did it but I got on the bus and an hour later after calling him my husband came to pick me up and found me on the floor in the middle of town holding on to a wall. I have lived with constant dizzyness and many other symptoms every day since then. Disregard nothing, but question everything. Hormones, weather and skipping a meal. I get a lot worse in winter too as I can't stand the artificial lights. I get a lot more classic migraines in winter and a lot dizzier too. It's hard to work out triggers when it's everyday, I have to go by what triggers a classic migraine and what makes everything spin more violently. Hmmm not sure to be honest, I try not to go to bed when the dizzies are bad as the last time I did that I couldn't get up for 6 weeks. Though when the pain comes I feel quite grateful to crawl into bed. My cat comes to sit with me, she just lies near my feet and she lies so still, I can barely feel her but knowing she is there is comforting. Like everyone, I am sure, I have had a few. ;) Mainly that I am depressed and or anxious. I was called a psycho once, not by a doctor I might add. I have been asked if I am used to it yet and told that we all get dizzy from time to time. I think the thing that has hurt the most is when people assume you aren't trying hard enough or have given up. Fighting doesn't always mean you have to force yourself to do things that make you more ill every day. Even the smallest things can take an enormous amount of effort. You know I am proud of a lot to be honest, my movement is very restricted and I am mostly housebound with this now but I have still managed to maintain a blog since 08 and I have taught myself many crafts which have changed my life, I have also been published in magazines sharing those crafts. The thing I am most proud of though is going to my sister's wedding and managing to dance the first dance, I will never forget that. I have had to give up a lot with this so carving out a kind of life is hard and I feel everything I manage to do each day (even if it's just getting up) is an achievement. Hannah is the author of Span's Studio where she shares her creative endeavors and how they help her to live despite living with MAV and constant movement. Well I think we should all do as the lovely Hannah says and be kind to one another this December! And give each other cake. 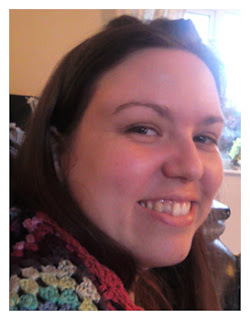 Hannah, thank you so much for being Migraineur Of The Month - you're a real inspiration and Migraine Monologues wishes you a healthy and happy 2013. I am a big fan of Hannah in general so it's super nice to see her here as Migraineur of the month! She truly is an inspiration. I like that you have called us "Miss November" and "Miss December". Can we have a sash?! !